Buy Alice, Where Are You Going? 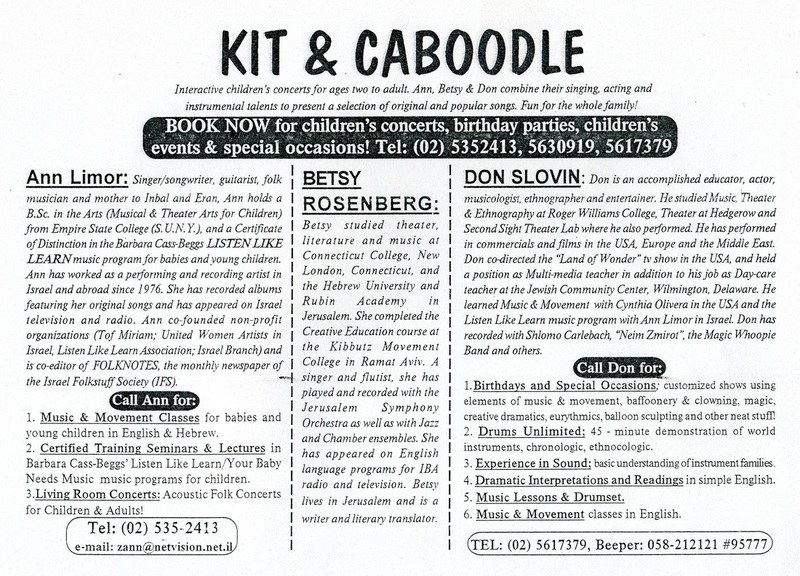 ﻿Kit & Caboodle is a collection of original songs by Betsy Rosenberg and Rahel that are loved by children and adults alike. ﻿Since its inception is has been enjoyed musically and as an interactive children's presentation and/or workshop. The actor-singers engage participants in singing, dancing, and acting out the songs as mini-musicals that are designed by the participants themselves. Original compositions include “Searching for a Whale”, “The Scaredy Song”, “Cowboy Cloud”, “My Bear”, “I’ll Be Fine”, "Ooey Gooey" and more! Rahel is a juried artist of the NH State Council on the Arts; N.E.F.A. (New England Foundation for the Arts) and N.E.S.T. (New England States Touring Artist). 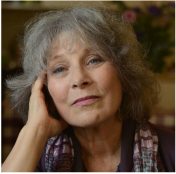 She is a recipient of the Shem Tov Award for her contributions to enriching Jewish life in NH and two-time winner of Israel's AACI English Songwriting Competition. Rahel began her musical studies at the Longy School of Music in Cambridge, MA. She holds a B.Sc. in the Arts from Empire State College where she majored in Musical and Theater Arts for Children. She holds a number of additional post graduate certifications. Rahel learned guitar according to the Berklee College of Music guitar method and continued her music studies in Israel at the Rubin Academy of Music in Jerusalem. 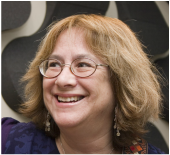 She studied Eurhythmics (Music Education for Children) at the Levinsky School of Music in Tel Aviv, and jazz guitar with Eitan Zahavi, Avner Strauss and Aharoni Ben Ari. 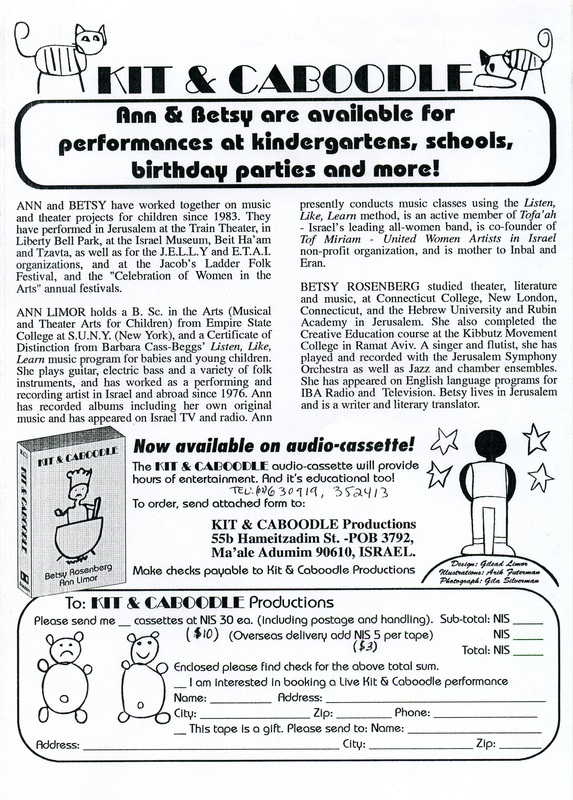 Rahel became certified in the Cass-Beggs Listen Like Learn music programs for babies and young children in 1986. Rahel's musical versatility has enabled her to perform as a soloist and with a number of musicians in groups, bands and ensembles. In 1976 Rahel immigrated from Boston to Jerusalem where she became immersed in the world of music. She began her career as a songwriter while performing with the "Tofa'ah" band. She was a member of many folk groups and appeared regularly at clubs and coffeehouses and annually since its inception at the Jacob's Ladder Folk Festival. Rahel won second place for two consecutive years at the AACI English Songwriting Competition and has recorded a number of CD's for children and adults alike. Since 1997 she has been engaged in the study and practice of music as a unique and powerful form of energy medicine that supports mind-body-spirit healing, transformation and transition. Rahel has been serving musically as a Therapeutic Music Practitioner since 2004 playing music at bedside and providing comfort and aiding in the process of transition in hospice, and in senior facilities including working with Alzheimers, Dementia and memory loss. Rahel offers concert-style musical massage and sound therapy sessions for individuals and in group settings, and has recently immersed in the study of Torah-based healing.